The human way of relationships is to establish a broad range of boundaries defined by gender, family, clan, and nation. In Acts 10, Peter learned in a dream that these are human, not divine distinctions (10-29). Peter had been taught not to eat with Gentiles, but upon reflecting on his dream, he concluded, “God has shown me that I should not call any man common or unclean.” (Acts 10:28) The old sacred order was based on exclusion, which has its roots in the violence of the sacrificial mechanism. The new sacred order heralded by Christ is nonviolent and devoid of scapegoating victims. James Allison has written, “Every local culture builds frontiers by means of victims; it is only if we begin from the forgiving victim [Jesus Christ, who forgave those who abandoned him] that we can build a culture which has no frontiers – we no longer have to build any order, security, or identity over against some excluded person.” This is the critically important lesson that Acts 10 teaches. I find it astounding and disappointing that, despite the clarity of the message, Christians have a long and tragic history of violence against excluded persons or groups. Furthermore, many Christians have received this passage as only communicating that we may eat animal flesh. Although Peter dreamt that no food is inherently unclean, the biblical account then relates that Peter did not understand what the dream meant (Acts 10:17). Peter concluded that the point of the dream was that Peter should eat with Gentiles. He did not conclude that killing and eating animals raises no ethical issues. The Apostle Paul emphasized that Jesus sought to eliminate the boundaries that keep us from loving each other: “There is neither Jew nor Greek; there is neither slave nor free; there is neither male nor female; for you are all one in Christ Jesus.” (Gal 3:28) What about the distinction between humans and nonhumans? Are humans and nonhumans “one in Christ Jesus”? I think in one sense the answer is yes and in another it is no. 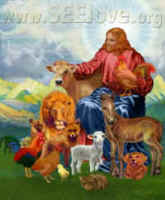 In one sense, animals join humans as part of Creation, which God loves. The covenant to not flood the earth was given to all creatures, and Paul’s letter to the Romans notes, “the whole creation has been groaning in travail together until now” (8:22). However, only humans are created in the image of God, which gives humans special responsibilities. Adam was instructed to till and keep the Garden of Eden (Gen 2:15), and it follows that his descendents should similarly care for God’s Creation. Next week, we will further explore Romans 8 and the means by which the “sons of God” will save the world.